St George players arrive at Entebbe Airport ahead of a tough encounter with KCCA FC. 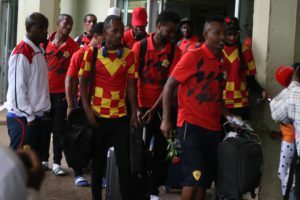 Ethiopian defending league champions St. George arrived today afternoon at Entebbe international Airport ahead of their return leg CAF Champions league first round encounter with KCCA. 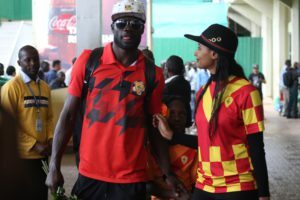 A group of 27 personnel, including Ugandan goalkeeper Robert Ondongkara, arrived in Uganda aboard Ethiopian Airways, . The group consists of 18 players and 9 technical persons and will be accommodated at the Golden Tulip Hotel. “It is a pleasure that Icome back to my home country for football, said Ondongokara upon arrival. “I and the rest all know how good KCCA FC are and we appreciate that it is going to be hard for us but we are also a strong side and are up for the challenge. “Come Saturday, we will do our best and hope luck is with us this time round. Odongkara has been with St. George for the last seven years after completing his move from URA in 2011 with whom he faced KCCA on several occasions. “I faced KCCA for both URA and SC Villa before i went to Ethiopia and i know how strong they are although the playing stuff and other personnel have changed a lot in the last few years. The Ethiopians face an uphill task of trying to achieve a result that will see them advance to the group stages of the competition. They will at least have to score one goal after the first leg ended 0-0 in Addis Ababa last week. They will train on Thursday evening and then hold their final training session the following day at 4:00pm at the StarTimes stadium in Lugogo. Odongkara faced KCCA a number of times while at URA before moving to Ethiopia.